The decor at Kintaro is really fun, warm and inviting. The way the space is designed with all the wood paneling, Japanese posters and tatami mats makes it feel like you're actually at an izakaya in Japan (not that I've ever been to Japan but just take my word for it haha). This visit to Kintaro was on a weeknight at 5:30 pm so obviously it wasn't busy at the time (who eats so early anyway?! Um....me). Seated at a table across from the charcoal grill, I watched the chef prepare skewer after skewer of delicious smoky meats. Kintaro's extensive three-page yakitori menu can be quite overwhelming with what seems to be an endless variety of skewers to choose from. Chicken, beef, pork, bacon, seafood, vegetables, fishballs, salad, sashimi! Just take a deep breath and slowly make your way through...you can do it. Or better yet order a beer or sake first...it'll help. Oh but wait there's actually a fourth page :) This page lists the noodle and rice dishes. 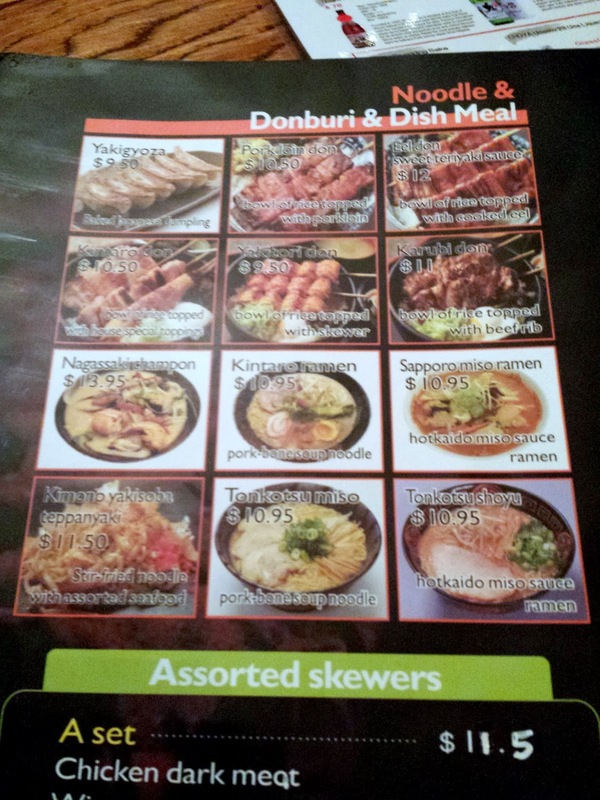 If all these choices seem too daunting I suggest you start off with one of Kintaro's two assorted skewers set menu. As I mentioned earlier yakitori is all about chicken. 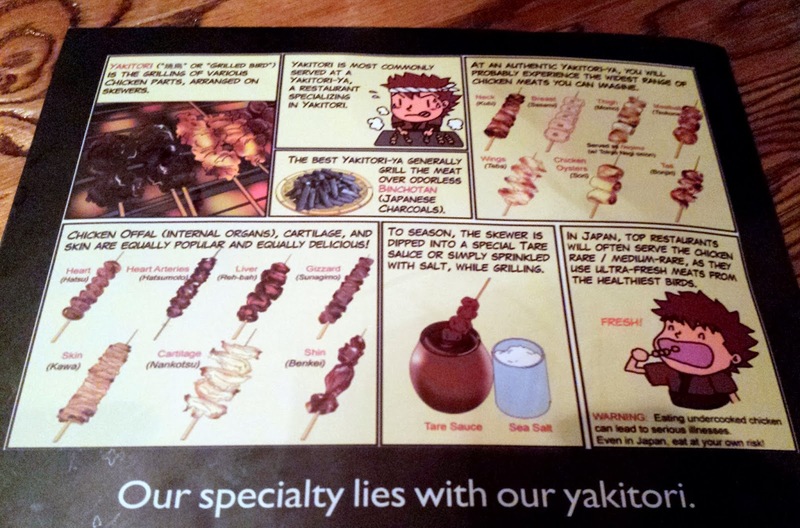 Kintaro even has a cute cartoon on its menu explaining it all. From your everyday chicken thigh, breast, wing to the not-so-popular cuts like neck and skin, and finally the internals like chicken heart, heart arteries, liver and gizzard, the Japanese certainly do not waste any part of the chicken. By the way, coolest water dispenser. Pump away! Juicy and tender bite-sized chicken thigh with soft and chewy pieces of mochi in between, these skewers were really nicely grilled and delicious. Whether you choose to slather that raw yolk on top or dip the eel straight in it, make sure you use it 'cause the runny yolk coating gives the eel a very different texture. The eel was cooked to perfection, and with the sweet glaze this dish is definitely worth $11.50. I do wish it was a tad cheaper just so I can order three orders for myself. A warning for those of you who can't take spice: the octopus here really packs heat with the generous amount of wasabi in it. I love the slightly crunchy texture of the fresh octopus. The side salad was nice and light, a very welcoming addition with all the grilled meats to come. Just like it was nice to have a side salad it made sense to order a veggie dish to balance out the meats. The seasoning and teriyaki sauce made these slices of eggplant incredibly appetizing. The unmistakably bouncy, chewy texture of pork neck is a favourite of mine. These pork neck skewers, finished with a squirt of lime juice and scallions, were nicely grilled and seasoned thoroughly. A bit chewy yet surprisingly tender, I find these chicken gizzards have the closest resemblance to chicken meat (compared to other offal cuts). This was the only dish I didn't like that evening. If I knew the rice cakes were in the form of a bun I wouldn't have ordered it (I thought they would be sliced). These had somewhat of a hard "shell" with a soft interior..nothing wrong with that but because all the seasoning and spices were on top, the rice cake inside was left bland and flavourless. A tasty and fun skewer to eat, there was a nice balance in the crunch of the cartilage in between the moist meat attached to it. I really wanted something more substantial to end our skewers feast and it was a no-brainer I would choose ramen (there are rice dishes too). We got the tonkotsu and it was nice and light, not rich nor fatty but also lacked flavour. The thinly sliced pork shoulder was semi-fatty and the noodles were decent. It was a good, average bowl of ramen in my opinion but it certainly did the trick - instead of feeling like I just had a bunch of snacks for dinner, the ramen made it more like a full meal. This salad was on the house and was given to us at the end of our dinner. Again, nice to have things like salad and fruits with all this meat action. The tomato salad was good but nothing special or out of the ordinary - just tomatoes topped with cheese. 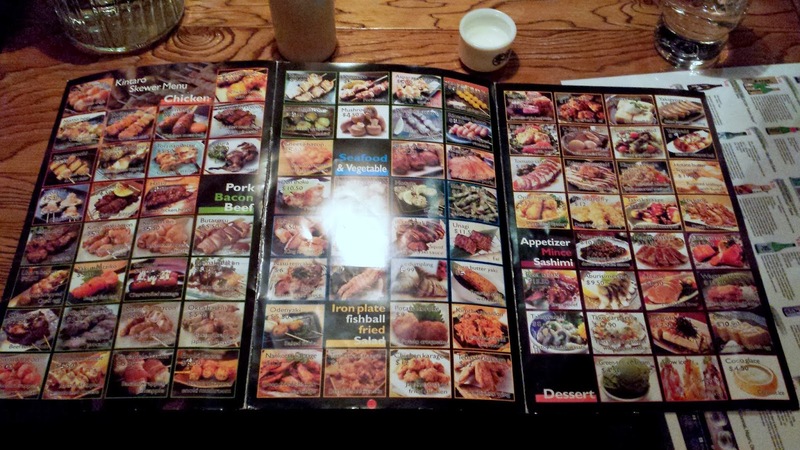 Given the quality of food that evening, I would go back to Kintaro in a heartbeat...there are still so many dishes to try! The distinctive, smoky charcoal flavour on all the skewers was a winner for me...I loved it. I also liked how I could have a conversation with someone sitting across from me without having to yell. I know I know... I went at 5:30 pm when there was perhaps one other table at the entire restaurant but I have heard from others that even when Kintaro gets busy it is still nowhere near as loud as Guu. I also want to point out that most of the dishes on the menu are really affordable - they range from $3.50 to $12, with some items closer to $20 (these are usually sashimi or seafood) - however just giving you a heads up now... it can add up after awhile especially if someone at the table keeps on ordering thinking that "it's just skewers we need to order more!" or "it's ok everything is so cheap!". The best solution? Go with a huge group of people and split the bill, that way you can try a bunch of dishes without breaking the bank.